Who’s in the woods going for a walk? Look closely through the trees and have a guess… It’s Spot! Who’s in the garden watering the flowers? Peep through the window then turn the flap… It’s Tom the crocodile! 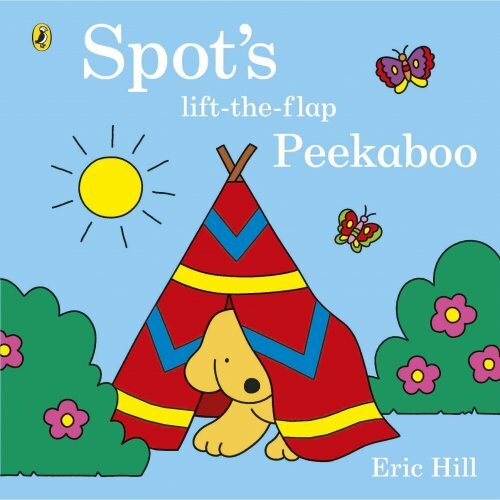 Spot’s Peekaboo is an engaging and fun lift-the-flap book for little ones. Use it to work on developing your child’s understanding of ‘who’ questions, as well as prepositions. The flaps are thick, sturdy and have little peep-holes which show parts of the animal hiding behind it. These peep-holes allow children to make simple predictions about who might be hiding on the other side. The illustrations show the animals taking part in some simple activities making it perfect for teaching action verbs. For further speech and language targets in Spot’s Peekaboo: A lift-the-flap book, see the list below.